The Parish Church of St Michael & All Angels has enjoyed a long and varied history of liturgical music. The choir practice on Thursdays 6.00pm – 7.30pm, singing at our Sunday Eucharist 10am and our evening services at 6pm. All are welcome to join us. Choral Evensong is on the 2nd Sunday of the month. There has been an organ to lead the music since at least 1600, shortly after the time of Bernard Gilpin. 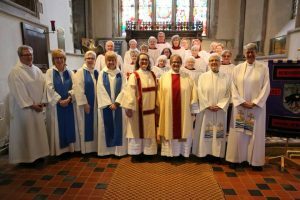 It is reputed that our church was the first in the Diocese to introduce a surplice choir since the Reformation.The choir is made up of a group men and women who lead the singing in our services and take an active part in our church community. The choir is affiliated to the Royal School of Church Music and take part in their events.